As some of you may know, I made the big decision to resign from my corporate job last month. With my youngest son about to graduate from University in December, I feel I can finally do some things I have been putting on the back burner for a long time. So with only two corporate trips left I really wanted to make the most of my time to check out the yoga scene. I travelled to Amsterdam in mid-September for a training event. The first think that struck me was the sound of birds piped into the arrival hall, just close your eyes and you could be somewhere in nature. I left the airport smelling the rain that had just stopped and a super friendly taxi driver took me to the Okura hotel, located in De Pijp area overlooking the canals. I finished my conference calls and then started looking for yoga studios on the internet. There are around 10 in Amsterdam and one, Unlimited Health, was just 10 minute walk from my hotel. The place was is started by Anil Kumar and his Dutch wife 9 years ago, first as a yoga studio and then a health food store now a small raw organic café. The yoga studio is on the ground floor and can take up to 50 people comfortably. The class cost 5 euros for your first visit and 7 euros after that, which is AED 35! I joined the 90 minute hatha class at 4.30pm. We were 10 students seated quietly when suddenly a tape came on and the voice of an English lady guided us through a 10 minute meditation. I woke at 6am and went to a 7am vinyasa class at Delight Yoga taught by Fleur Van Zonneveld. The studio is located near the Rijks museum on the top floor of an old house. The class cost 15 euros as a walk in but you can pay 100 for 10 classes. Delight has 2 studios in Amsterdam and offers teacher training and lots of workshops. I was slightly late and was ushered up the narrow stairs to the top floor studio. The mats were the same as mine, Hugger Mugger! Fleur studied with my teacher, Julie Martin at Bhramani yoga and I loved her style. As we moved through the poses, the sun began to rise and flood the room. We were 12 morning warriors moving in synchronicity together to the start of a new day. The class was also taught in English. 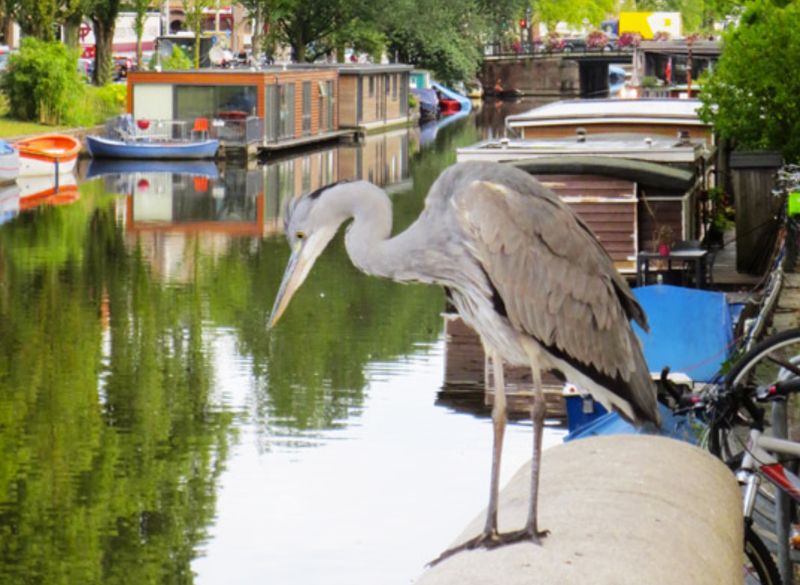 I walked back along the canal and saw a beautiful gray crane on the bridge just in front of me. I felt really blessed to be starting a work day in such a peaceful way. My husband arrived and we spent the weekend at an AirBnB property in the old city overlooking the canal. 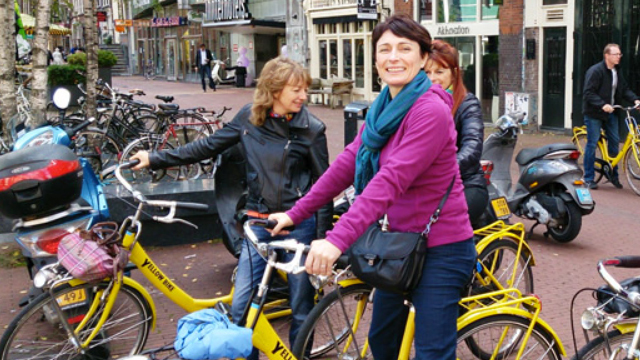 We attended a string quartet concert in a Menonite church, toured the Rijks museum, walked miles through rain and sun and had a half day cycling trip in North Amsterdam with Yellow Bike Tours. The yoga scene in Amsterdam is very well established and offers lots of options and styles. I highly recommend a weekend in this beautiful filled with flowers and genuinely chilled and happy people. Just don’t forget to pack an umbrella.